Stoat: Did you miss me (yeah) when I was away? Glitter isn't entirely in fashion nowadays for regrettable reasons, but hey I like the song. My three week odyssey around Europe is complete; having driven through France, Italy, Switzerland, and back through France2 without hitting anything, no mean feat on narrow mountain roads and around lake Garda, I managed to prang someone in Waitrose car park. Is that fair? There will be a pile of pictures at some point, but in the meantime Climate change is melting the French Alps, say mountaineers looks like a suitable text for a cheapo post. It is of course fundamentally true; you can't walk or climb high in the mountains without noticing the obvious signs of glacial retreat over the past few decades. We went to the top of the Sele pass from the Sele hut side, and looked down into the Pilatte basin. The descent is a most unattactive steep scree followed by ice and crevasses; though I suspect it's really not that hard. But 25 years ago it was pleasant snow for most of it. And the Glacier Blanc hut has a nice map of the glacial tongue showing it's retreat over the years. Though to be fair you also can't walk there without seeing the clear signs of much older retreat. Because it's a newspaper article, the journo is obliged to throw in something stupid an innumerate. Our man Simon Birch has chosen to demonstrate that he is an idiot with Another key impact of climate change in the mountains is that it is leading to an increase in the number of rockfalls; more than 550 occurred in the Mont Blanc massif alone between 2007 and 2015. I won't bother point out the obvious problem. 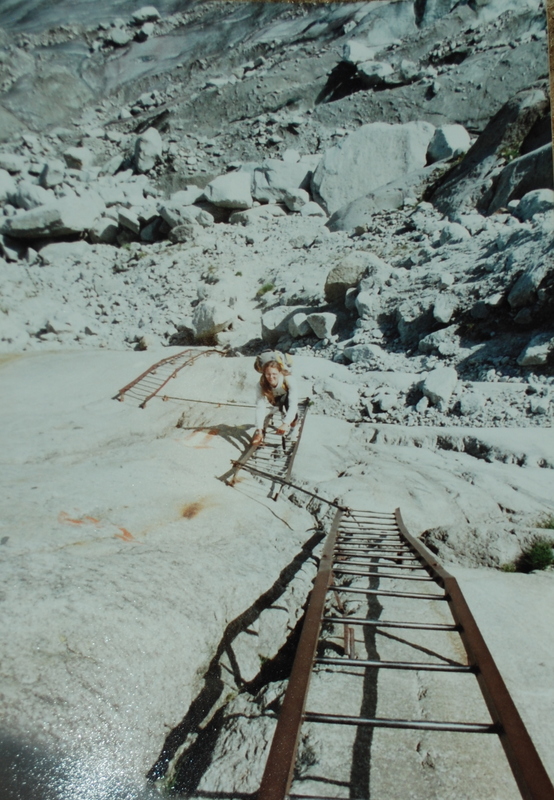 I'm a touch dubious about A stark consequence of the melting Mer de Glace is that 100m of ladders have now been bolted onto the newly exposed vertical rock walls for mountaineers to climb down onto the glacier. As my pic shows, there were pretty damn extensive ladders there 25 years ago; I doubt they've grown as much as 100 m since then. The source of the article seems to be more about permafrost melting leading to more rockfalls; that could easily be true, and might also be somewhat worrying, as in general you kinda hope for all the serious rockfalls to happen out of season. There's also Significantly, climate change is happening almost twice as fast in high mountains as compared to the rest of the planet. That's sourced directly to a scientific paper - good heavens - Mountain Climates and Climatic Change: An Overview of Processes Focusing on the European Alps by Martin Beniston. Sourcing to a paper is to be commended1, though in general newspaper should - like wiki - avoid referencing the primary literature, although the paper is an overview. But it is from 2005, and the mountain-vs-world temperature comparison it uses is for the Swiss Alps only, dates from 1997, and actually says it is three-fold higher; perhaps that seemed implausibly large to the journo who decided to tone it down to two-fold. It's not a focus of the paper, though, and isn't even mentioned in the conclusions. Perhaps a better source would have been Elevation-dependent warming in mountain regions of the world, by the "Mountain Research Initiative EDW Working Group", an irritating group of people who link to some of their papers - because the metric all scientists care about more than anything else is papers - and some (inevitably mangled) press coverage, but don't actually bother to tell us what their conclusions were. Never mind, it was enhanced warming compared to the global average (inevitably, since land warms more than ocean) and likely more than the land average, given obvious albedo-y effects and so on. 1. Actually reading the paper would be even more commendable. 2. On about 4- tanks of diesel, so since I was one of four my personal contribution is about 80 litres. Apparently a Jumbo from London to New York burns about 70k litres of similarish stuff, between 450 people, which is about 160 litres each, and my daughter recently went both ways, so I'm at least doing better than her. More important, did your bad bees miss your bad bee keeping? If you passed through Geneva, you could have popped in at the WMO's HQ and asked them why their per cap emissions from flying are so high: 15 tonnes CO2/employee in 2016. And that's just an average. Most WMO employees would have been deskbound throughout the year, so someone there is doing a humongous amount of flying. We did pass through Geneva, though that turned out to be a mistake at 3 pm on a Friday afternoon, strangely enough. We only went that way because we listened to our idiot satnav instead of Google maps. We did get to see the famously boring jet d'eau. DB: I haven't made it to the bottom of the garden yet. The drought is over, England is full of rain.